Those in the sixth house can be very controlling, in that you need things to be perfect. Pluto amplifies that need and makes you feel as if anything you work on should be yours and yours alone. This can be a problem if you have to work in a group. Pluto has to do with renewal, generational changes, coercion, and power. 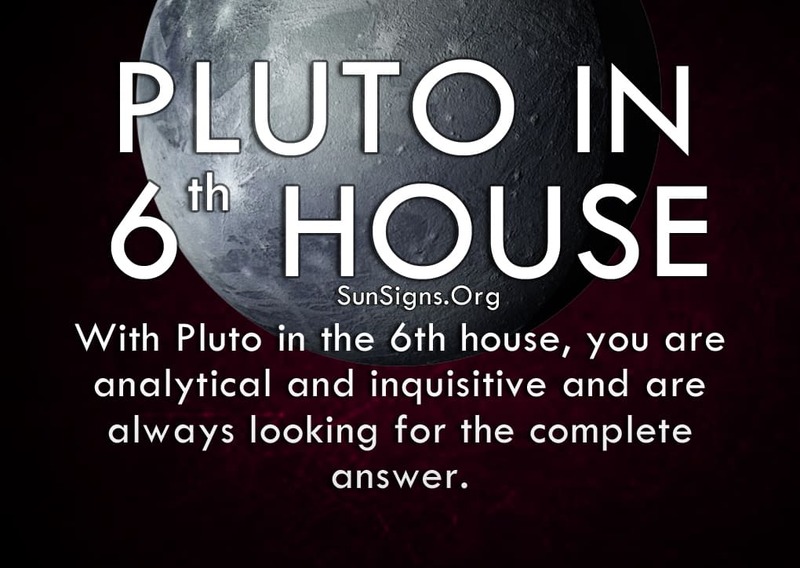 With Pluto in the sixth house, you are analytical and inquisitive and are always looking for the complete answer. You don’t rest until you’ve researched every aspect of a topic, and even then you often create more questions than answers. It’s almost like you’re never satisfied with the response, like there must be something more you’re missing. Some of this stems from fear of criticism and rejection. The one good thing about your intensity is that you almost always solve the problem presented to you. People with Pluto in 6th house are a whiz at research and logical thinking, mostly because you see all the different angles from which you can approach the problem. Your attention to detail pays off here and nothing gets by you. This makes you someone that people go to for advice on simple and more complex problems, whether in your career or personal life. Co-workers, friends, family and romantic partners all know they can rely on you to get things done quickly and efficiently. Because you are such a perfectionist, you want everything to be correct down to the smallest detail. So for you, you can never do enough research to satisfy that need. This becomes a problem whenever anyone else is involved in your work process, because no one takes things as seriously as you do. Some would think the world was crumbling from all the effort and importance you place on a single task. And for those people, anything you do is going overboard to them. Read more about symbolism of Pluto in astrology. But it’s that initial fear that runs the show and you can’t help yourself. Because Pluto in 6th house are so critical, you expect to be judged by those same expectations. That’s not always the case, however, and you can put a lot of unnecessary stress upon your shoulders. This can lead to mental and physical health problems, including depression, insomnia, peptic ulcers, and other stress-related symptoms. Pluto in sixth house effects show that you have to learn to take a step back and not place so much pressure on yourself or your team. Some things in life are important, of course, but you have to learn to prioritize those things in order of just how important. It’s easy to become paranoid that people are out to sabotage your efforts. You might feel that the “universe” is working against you when you become so obsessed with something and it isn’t working the way you thought it would. It’s imperative that you find a way to gain perspective on such things so they don’t end up running your life. You thrive on being meticulous for that’s how you feel most useful in society. That’s why you are so protective of your working process, because it’s where you gain the most self-worth and confidence. Without that confidence you feel as though you may not be as good at analyzing something, so you need to maintain that stamina. Just believe in yourself and your abilities and the rest will fall into place.